For over 40 years, Rebbetzin Esther Jungreis has been a globetrotting spokeswoman for Judaism. Whether counseling a searching soul or addressing a packed house in Madison Square Garden, her message is elegantly universal, while simultaneously addressing the specific needs of contemporary Jews. In Life Is a Test, the Rebbetzin's uncompromising convictions, her insights on faith, her soul-stirring wisdom, and her palpable love of all people saturate every page. 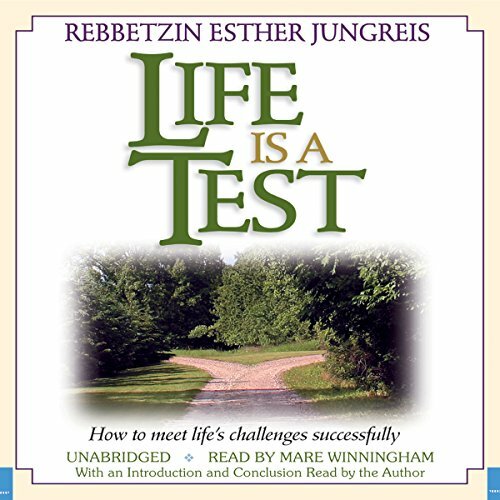 Life Is a Test is really three audiobooks in one, each bearing a particular focus to help readers look for the hidden significance in challenging circumstances. The audiobook begins with tests of self-discovery and then examines the challenging realm of interpersonal relationships, concluding with a section on perceiving Divine Design in the big picture of global events, as well as in one's own world. Regardless of age or experience, people of all persuasions will find meaningful substance in Life Is a Test. Rebbetzin Jungreis has captured many of our deep-seated questions, and has graciously provided us with a decipherable answer key. This book provides a true awakening of your inner purpose and helps you realize that every experience, good or bad, has a learning purpose. It does not matter which religious background the reader has, the case stories and the message presented is very inspiring. A must read. There could be 99 out of a hundred good things i could say about this amazing book, but im only going to say one bad thing about it: "why isnt there more books like this book? we want more books like this one!" and could you please make an audio version of "living comitted" ? Rebetzin thank you for all your knowledge. I enjoyed thoroughly Rabbitzen Jungreis ' knowledge of the Torah and application to the lives of those who came to her for counsel. This was a phenomenal book. I am so glad I read it when I did. Was having a difficult week and this book, just showed me how everything is connected. Really need this book and really recommend it.